The Wonder Trade feature in Pokémon Sun and Moon is dice roll: you put a Pokémon in, get a random Pokémon from somewhere else in the world in return. 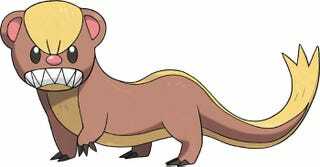 Out of 700+ possibilities, players keep spotting Yungooses named Donald Trump circulating on Wonder Trade. Fans have thought the reality tv star and the Alolan Pokémon have looked similar since the Pokémon was announced. He does kind of look like a rodent with a bad combover, doesn’t he? Youngoos is also an extremely common Pokémon in the early stages of the game, which makes it easy to grab an extra one for a quick gag. One might assume that naming this monster after the United States President-Elect is some kind of political statement. Perhaps they’re mocking the guy by comparing him to a cartoon weasel. Perhaps they’re one of those particularly edgy individuals that thinks sending the words “Donald Trump” into the ether will have a negative emotional affect on a stranger. For what it’s worth, I caught a Yungoos with the intention of Wonder Trading him. I nicknamed him HaveANiceDay. Here’s to hoping you’ll see him soon.